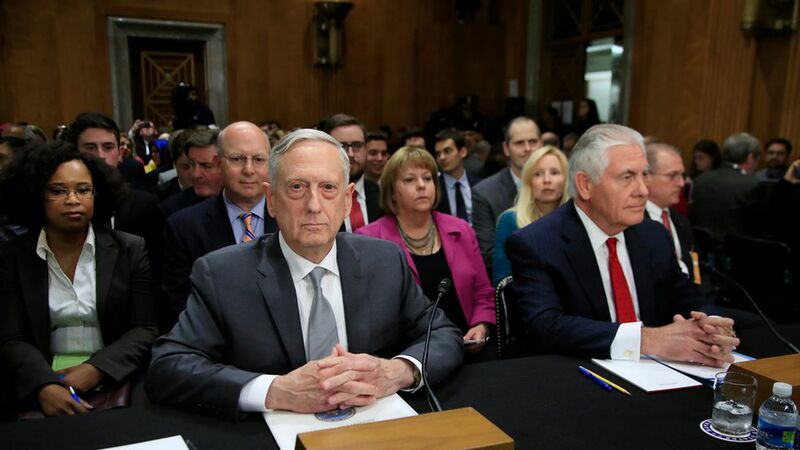 Mattis: New war authorization "not legally required"
Secretary of State Rex Tillerson and Defense Secretary Jim Mattis told the Senate Foreign Relations Committee Monday evening that they think any new authorization for the use of military force (AUMF) should be neither time-restricted nor geographically-restricted. As Mattis sees it, that's "because war is fundamentally unpredictable" and ISIS is "transnational." Mattis also told senators "a new AUMF is not legally required to address the continuing threat" posed by terrorist groups. Why it matters: The deadly Niger ambush has elevated lawmakers' questions about the AUMF currently used to justify military action abroad. It was passed in 2001, long before the existence of groups like ISIS that the U.S. is now fighting. On repealing old authorizations: Mattis added that he does not think the old AUMFs must not be repealed for fear of jeopardizing legal battles with terrorists, including "al-Qaida, the Taliban, and, we believe, ISIS." Tillerson said something similar, but noted new AUMFs should be in place before repealing old ones since "failure to do so could cause operational paralysis." On military force against North Korea: When asked to clarify that Trump has no authorization from Congress to use military force against North Korea, Tillerson answered, "that's my understanding, yes." Tillerson said he does not think there should be operational restrictions, "given the way this particular enemy morphs, changes its tactics."